Is there a better combination? It must be very evident by now that I am crazy obsessed with beets. Over the course of this blog, I have had about 9 beet recipes and, rest assured, there will be many many more to come. So, why am I so obsessed with beets? I wish I had an answer for you! I just love their taste could answer that. After all, it is a messy vegetable that likes to leave stains on anything it touches. I even left a beet stain on a bride’s white veil! It is a true story and remind me to tell it to you someday. This is, by far, my favorite beet recipe. 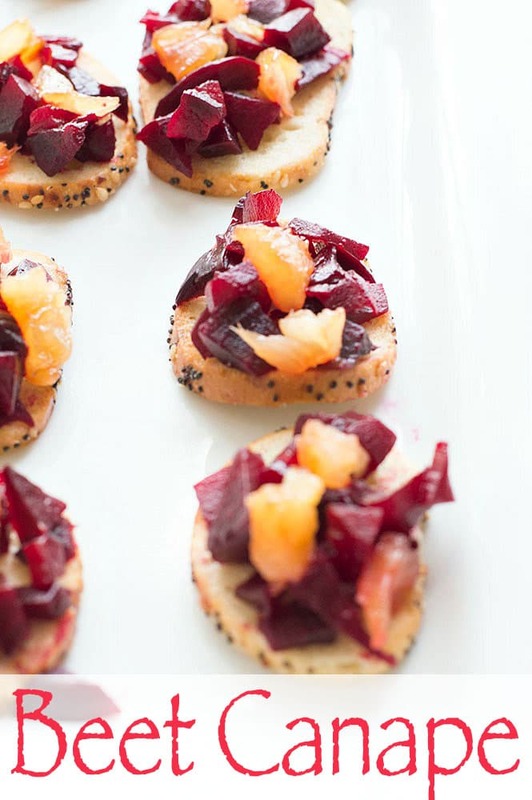 That roasted pineapple with rum is the perfect match for these beets. They are the Sunny and Cher of toppings! There is no base for these toppings like bagel bites. I went with the everything bagel bites because they have so much flavor and it holds the toppings without going soggy. They were photographed, rearranged and moved to different locations in a span of 30 minutes. 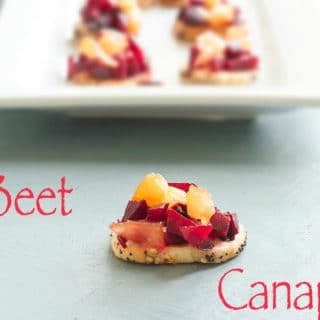 When I consumed them finally, each beetroot canape was crisp and delicious! Just a healing tomato secret, I started with 3 serving plates of these canapes. 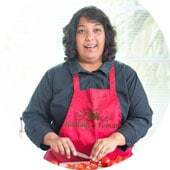 By the time the photo shoot was over, I was down to 1/2 of a serving plate. My guests consumed some of it, but, I was the biggest culprit! I just can’t resist healthy and delicious vegan appetizers. The toppings list is limitless. You can add any ingredient that you can fit on a small piece of bread or bagel. 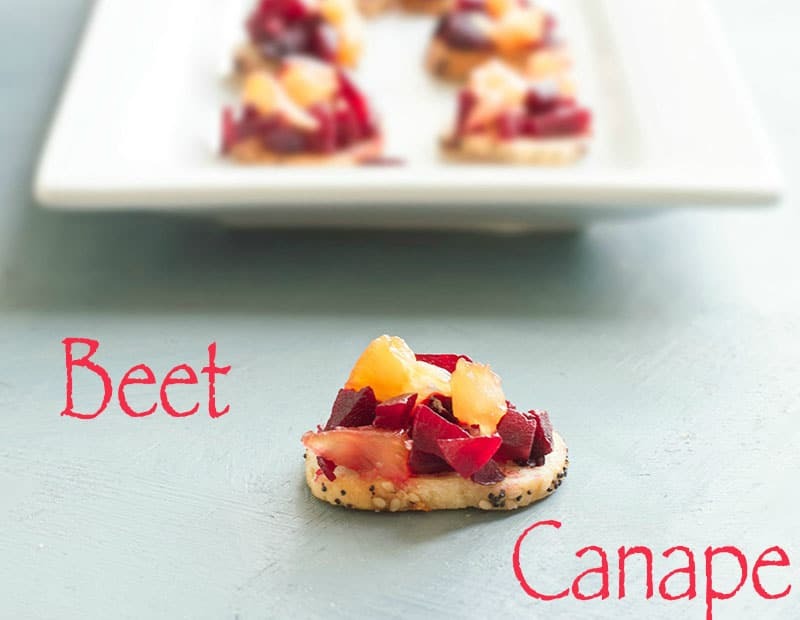 So, what’s your favorite canape topping? I’m crazy about beets too! Lovely appetizers to share with guests. Forget the kids and add the rum! Thank you, Sandra. LOL! Rum, For the win! I am crazy about beets too! Love this recipe! I enjoy beets too. I love their texture and flavor however they are prepared. These little bites look addicting. Thank you, Michelle. So happy to hear that you are a beet lover too! These looks like such a beautiful bite. One of these days I’ll try beets and if I do, you can know it’s from your tempting looking recipes! Thank you, Christine. OMG! You have to try beets! They will change your life. Also, they are very healthy and delicious! I love beets too, especially when roasted, but have never paired them with pineapple, it sounds like a wonderful combination! Thank you, Joy. This was a fun experiment and I am so glad it came out delicious. Really pretty! Pinned to my vegan board!